An hour and a half of trance-formative time with me whenever you need it. This bundle has three powerful meditations that incorporate guided visualisations with NLP techniques, binaural sound, and more, to give you a uniquely personal, deeply transformational, meditative experience. Get Energised: For those times when you are low in energy. This has a knock-on effect to how you capable and confident you feel. So let’s got energised first. 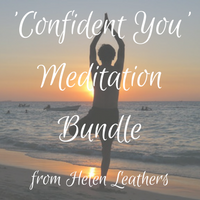 Confident You: A dynamic meditation to help you feel quietly and calmly confident and ready to face the world, your boss, ‘that’ discussion, or even just the housework (we all have days where we can’t even manage that). Claim Your Space: To help you claim your space in the world, or at least your little part of it, and give you the presence required for whatever you are about to do. Stand in your own gently power and know that you are worth it. Your bundle includes 3 MP3s and a quick guide to using my dynamic meditations so that you can get the most from them. Enjoy your meditation bundle and make sure you download it to your phone, tablet or computer so you know exactly where to find all of the meditations. Please remember that this file is for you but the copyright is owned by me (Helen Leathers). These files should not be distributed or shared with others. A lot of study, preparation, work technical knowledge, emotions and effort, as well as expense, has gone into creating these meditations for you. So please enjoy them, and tell people about them, but do not share them. P.s. If you’re not very technical, it’s easy to unzip a file. Simply double-click on it once downloaded, and all your files will appear as if by magic.